Properties in Gottenheim average 4.5 out of 5 stars. Property 19: Modern holiday apartment, perfect for the city and enjoy nature! 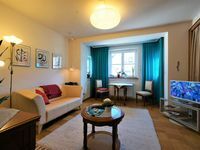 Property 45: Pretty 2 - room apartment, cable TV, W-Lan, balcony, etc. War sehr schoen, schoen ruhige Lage, direkt an der Strassenbahn, auch am Seepark, gute Wohnkueche und Frau Schneider war sehr nett und hilfreich. wir wuerden die Wohnung unbedingt empfehlen. We stayed for 9 nights in December of 2018 and had a wonderful, relaxing holiday. The property is very centrally located. Just a few minutes walk from the train station and so close to everything. Shopping, restaurants, cafes are all easily accessible. The apartment had all the amenities of home and was very clean and updated. The beds are comfortable and we had no problems sleeping as it was very quiet. Washing machine, coffer maker, fridge, oven, stove, dishwasher, hairdryer, large screen flat TV. All there for your comfort and convenience. The very kind owners respond quickly to any messages and met us at the property to let us in and explain the basics to us. We loved our holiday in Freiburg and would definitely stay at this property again. 5 stars!! !